UCF’s Collegiate Cyber Defense Competition Team is no one-hit wonder. 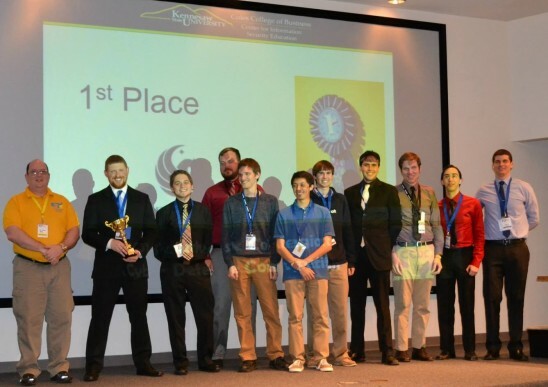 The team just won the 2014 Southeast Collegiate Cyber Defense Competition for a second consecutive year. “I’m extremely proud of them,” said faculty sponsor and computer science lecturer Tom Nedorost. “They put in a lot of hours getting ready, often practicing late into the night during the week and all day on Saturdays. I know they are very grateful for all the people who support them. The competition was held March 31 –April 2 at Kennesaw State University in Georgia. Teams from 18 universities entered the qualification round this year and the top eight teams were invited to compete at this regional competition. Raytheon, the U.S. Department of Homeland Security, and the U.S. Army Intelligence & Security Command sponsored the event. The competition consisted of each team setting up a small corporate network for the fictional HAL Corp. Throughout the three- day event, the teams worked to keep their business services operational while defending against a barrage of continuous cyber attacks by a group of 20 experienced penetration testers (professional hackers) who volunteer their time to make this event possible. For some, such as UCF team captain Carlos Beltran, the experience was exciting, but he said he knew what to expect because he was on last year’s winning team. For others, such as team co-captain Jason Cooper, it was a brand new adventure full of adrenaline. Other team members are: Austin Brogle, Alexander Davis, Kevin DiClemente, Dale Driggs, Grant Hernandez, Mark Ignacio, Heather Lawrence, Cody McMahon, Troy Micka, and Joe Pate. The team will travel to San Antonio for the National Collegiate Cyber Defense Competition on April 25-27. The competition sponsors include Raytheon, the U.S. Department of Homeland Security, Splunk, and Walmart among others. Last year, the team took 10th place at the national competition. Team members will spend the weeks leading up to the competition practicing and continuing their weekly outreach to the public. Because of recent cyberattacks against Target and Neiman Marcus, where credit card and other personal information was stolen, to basic risks such as not securing a Wi-Fi connection at home, the team tries to educate the public by dropping the technical jargon and offering tips the average person can use. This is really cool! Makes me proud to be a UCF engineering student, great job guys!